Among the surprises that I experienced in my first year of teaching English in Turkey was calling the roll and finding that one of the students was named Genghis. Well, I have to admit that was after I’d begun to get my head around the idiosyncrasies of the Turkish alphabet, and realised that’s how we write the word spelled ‘Cengiz’ in Turkish. Anyway, there he was, a slightly overweight 15 year-old, with nothing much to distinguish him from his uniformed classmates – Genghis! Now, of course, I think nothing of it. I have worked with and taught several more Genghises, and suffered no physical harm at their hands. I have had colleagues and students, to all intents and purposes, quite normal, well-adjusted human beings, despite carrying the name Atilla. Kubilays and Timurs have passed through my classes arousing no more interest than if they were so many Michaels or Tylers. Nevertheless, my initial experience of shock, or at least surprise, illustrates an essential disjuncture between the world-views of the peoples of Western Europe and Western Asia. 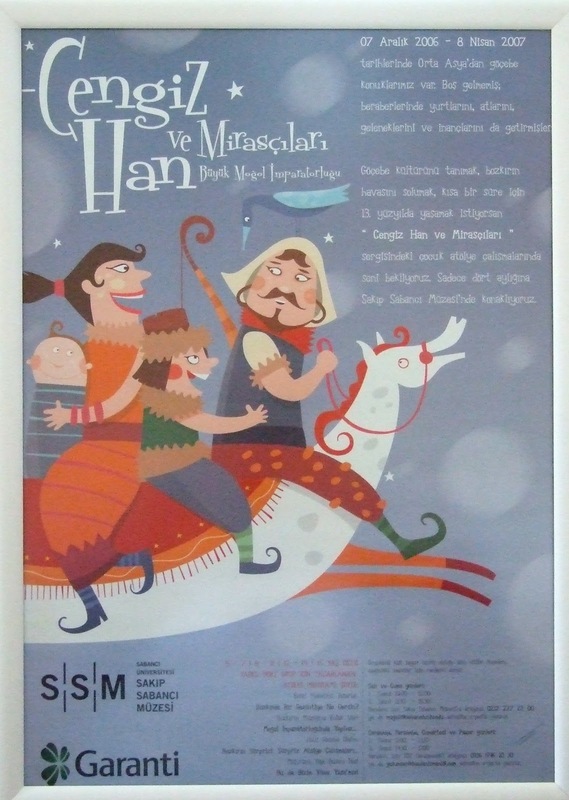 Clearly, an educated, law-abiding, middle-class Turkish couple choosing to name their new-born son Genghis, are unlikely to have in mind the same picture of a barbarian chieftain leading his marauding hordes out of Central Asia that the name conjures up in Western circles. What I want to explore here is the thesis that Western views of Turkey have been shaped by historical and societal events going back at least a millennium and a half and continuously reinforced by subsequent events, and by religious and political leaders for their own, sometimes questionable, purposes. I’m taking, then, as an arbitrary starting point, the activities of one, Atilla the Hun, who terrorised the Western and Eastern Roman Empires in the 5th century CE. This legendary character headed an empire that extended well into Western Europe. His military forays took him through Germany into France and Italy, and threatened the twin capitals of Rome and Constantinople. Atilla’s origins are not entirely clear, but certainly the Huns emerged from Central Asia, and may have spoken a Turkic language. Undoubtedly there is a long-standing association, in European minds, of Turks with mayhem, rapine, and generally uncivilised, anti-social activities. For some reason, this association does not seem to extend to Arabs, despite the fact that the armies of the Prophet swept through North Africa and into Spain in the 7th century CE, establishing an empire that stretched from Spain to India. Perhaps it is because Europeans recognise the debt we owe to Arab scholars who preserved the writings and wisdom of the classical world, which later fuelled the European Renaissance. Or perhaps it is that the rise of the Seljuk and Ottoman Turks established them as leaders of the Muslim world, relegating the Arabs to a minor role in international affairs. Perhaps too, the European mind, for some centuries, considered it unnecessary to distinguish between Turk and Arab, finding it convenient to tar both with the black brush of Islam. In recent years, with rising fears in the West of cross-cultural clashes and axes of evil, the focus has tended to be on the adherents of Islam rather than on Arabs, who have arguably contributed more to the negative image of Muslims in the US and Europe. Whatever the case, it was the Turks who bore the brunt of Western Europe’s fear of and antipathy towards the Muslim religion, which seems to have emerged strongly in the 11th century. It was in 1096 that Pope Urban II launched the First Crusade – an army (or two) of Christians from Western Europe who set off on the sacred task of defending Christendom from the Muslim ‘invaders’, and liberating the Holy Places (Jerusalem etc) from their clutches. As usual, there is debate amongst historians as to the exact reasons for this and subsequent waves of Crusaders that launched themselves eastwards. In the first place, there was certainly an appeal addressed by the Byzantine Emperor Alexus Comnenus to the Pope in Rome for his help in fighting the Seljuk Turks who had recently defeated the Eastern Christians in a major battle, and begun serious incursions into Syria, Palestine and Asia Minor. While it may seem at first attractive to imagine brother Christians helping each other against a common (heathen) enemy, in fact, there was little love lost between the Eastern and Western churches. It had been only 40 years since the final schism in 1054, which firmly established their mutual incompatibility. Secondly, it is certainly true that Western Christians were at least partially motivated by the belief that the Holy Places of their religion had fallen into the hands of unbelievers. It is also true, however, that these places had been in the hands of Arab Muslims for more than 400 years. Why the sudden concern, we might ask? Undoubtedly the Turks posed a threat of a different kind. The Eastern Christians had managed to maintain a buffer against Arab Islam, and Constantinople had withstood their attempts to conquer it. The existence of this Eastern barrier had protected Europe from Muslim invasion at a time when it would have been particularly vulnerable. The Arabs were obliged to take the long way around, via North Africa, into Spain, by which time, we may imagine, their supply lines were somewhat stretched. Suddenly, however, in 1071, the Byzantines had been heavily defeated by a Muslim Turkish army – it could have looked like the thin edge of a new wedge. Third, this event happened at a crucial time in European history. European Christendom was a fragile, relatively new bud. The Carolingian Empire of Charlemagne that had emerged in the mid 8th century, had fallen apart by the middle of the 9th. A century later, the Pope had found a new hero in a German king by the name of Otto, and begun grooming him to be temporal ruler of a new Holy Roman Empire. However, Europeans at that time had no real concept of themselves as such, and Western Europe was divided into numerous warring feudal states. The Seljuk Turks, then, might be seen as a convenient threat whose existence could be used as a means of uniting Europeans against a common enemy. In fact, they were not ignorant barbarians, as their art, architecture, literature and philosophy show. Educated Westerners know the verses of Omar Khayyam, through the translation of Edward FitzGerald, and the Sufi philosophy of Mevlana Rumi. But religious leaders, and seekers of political power are not always interested in the whole truth, and a timely war can help paper over internal divisions and generate a unity of spirit and purpose, as Margaret Thatcher and the Bush father and son can verify. So, the Seljuk Turks became the Pope’s bogeyman to terrify Western Christians into laying aside their internecine squabbles and uniting under the banner of true religion. They were assured of finding a place in paradise in return for fighting the good fight against the Saracens, pagans, infidels and Ishmaelites who were polluting the Holy Places. It may also be that the Holy Fathers were a little envious of their Eastern Christian brethren who had retained a temporal empire to go with their spiritual dominion, and saw an opportunity to bring them down a peg or two. Certain it is that the forces of the 4th Crusade in 1204 took time on the way to engaging the Muslim foe, to stop over long enough to besiege, conquer and loot the Christian city of Constantinople. That city remained in Western hands until the Byzantines were able to retake it some 50 years later, by which time much of its fabled wealth had been relocated to Italian cities, and Byzantine power had been seriously diminished. Genghis Khan, on the other hand, deserves much of his bad press. His armies swept through Central Asia and the Near East in the early 13th century. After his death, his son Ogedai continued the thrust into Hungary and Poland. Whether or not the Mongols were Turks is a moot point, but certainly they were not Muslims at this time in history. Muslims in fact suffered at least as much as Christians from Mongol depredations – Persia (modern Iran) was invaded and much of Islamic-Arabic civilisation was destroyed. Ironically, it may well be that Genghis and his Mongol hordes thus assisted Christendom by facilitating their re-conquest of the Iberian Peninsula. Timur, (Tamerlane), another Central Asian warlord, and another open to several interpretations, is in fact less known in the West, perhaps because he caused more damage to Turks, fellow Muslims and Hindus than to Christians. The Ottoman Empire was on the rise in the late 14th century when Timur and his armies defeated Sultan Beyazit, creating an inter-regnum and a serious blow to the emerging power in Anatolia and the Balkans. Nevertheless, all these events and characters have been lumped together in European folk history to create an image of ‘The Turk’ that, by the 16th century had crystalised into a heathen figure of darkness and savagery. I haven’t personally counted them, but I have it from a source I have no cause to question, that there are thirty-five references to Turks in Shakespeare’s plays, all of them referring to a fearsome threat in the East. Indicative of the confusion in European minds is the play ‘Tamburlaine’, written by Christopher Marlowe in 1587. Timur, as discussed above, undoubtedly had a far more recent connection to Central Asian Turkishness than the Ottoman Sultan, but English theatregoers were encouraged to cheer Beyazit’s defeat and humiliation at the hands of Marlowe’s hero. Of course, the reign of Kanuni Süleyman (1520-66), known in the West as Suleiman the Magnificent, marked the pinnacle of power of the Ottoman Empire, as his armies achieved dominance through North Africa, the Middle East and Eastern Europe as far as the gates of Vienna, while his navy controlled much of the Mediterranean. The existence and power of the Ottoman Empire at this time were a major spur to the ocean-going explorations of Western European nations, who needed a safer route to the East. The Ottomans were not, in fact Turks, in any genetic sense of the word. It had been nearly 500 years since their ancestors had conquered the Byzantine army at Manzikert. Modern DNA analysis suggests that the genes of those Seljuk invaders had been thinned by intermarriage with the indigenous inhabitants of Asia Minor. Ottoman Sultans filled their harem with toothsome young lasses from the lands they had conquered, and by the 16th century, Süleiman’s Turkic blood would have been well diluted. To be Turkish, in fact, did not convey a very high status in a cosmopolitan empire whose citizens included Christians, Jews, Arabs and Persians. European use of the title ‘The Grand Turk’ to refer to the Ottoman Sultan, and the name ‘Turkey’ to refer to their dominions, likely sprang from an attempt to belittle and diminish a people they, perforce, had to respect and fear. Atatürk, the founder of the modern Turkish republic, had his work cut out for him in his attempt to forge a unifying identity from those who remained after other national groups had split off and gone their separate ways. However, I am jumping ahead of myself here. We are still back around the turn of the 17th century, but the tide was turning in European affairs. The Ottoman Empire was still a major force, and would remain so until its final demise in the First World War. However, new military technology and training, professional armies and the ability to work together against a common enemy were beginning to give an edge whereby rare and infrequent victories over the Ottomans became more regular and eventually the expected norm. Fear of ‘The Turk’ began to be replaced by a curiosity and interest in things Turkish. As trade and diplomatic relationships increased, wealthy Westerners began to imitate and adopt aspects of Ottoman/Turkish art and culture – it was known as ‘Turquerie’, and was particularly fashionable from the 16th to the 18th century. By the 19th century, as the Near East became increasingly accessible to the Western traveller, ‘Orientalist’ artists began to portray ‘Ottoman culture as colourful, exotic and sensual, qualities to be seen the work of the French painter Ingres who was particularly keen on depicting ‘odalisques’ – less exalted members of the Ottoman harem whom Ingres is most unlikely to have seen, particularly in the unclothed state in which he was fond of showing them. From quaint, sensual and exotic, it was but a skip and a jump for Europeans to accept the diagnosis of the Ottoman Empire, generally attributed to Czar Nicholas I of Russia, as ‘The Sick Man of Europe.’ As the 19th century wore on, the major European powers became more confident in using the Ottomans in their power games, now attacking, now supporting, as they manoeuvred around to ensure that each got the best deal when the ‘Sick Man’ finally expired. The Ottomans, and thereby the Turks, came to be seen as enfeebled, dissolute and corrupt, and fair game for Western empire-builders as they jockeyed for position in the new world that was emerging. It is entirely understandable. The once-feared enemy had become vulnerable, and it was too tempting to mock and belittle now that the threat had passed. Nevertheless, it can be dangerous to start believing your own propaganda. I have written elsewhere on the Gallipoli campaign in 1915, and the war that led to the emergence of modern Turkey in the 1920s, so I don’t intend to repeat the details here. It is pretty clear, though, in retrospect, that the British and their Allies in the First World War seriously underestimated the ability of Turks to defend their own shores from foreign invasion. It is also clear that certain influential figures in the military misrepresented ‘The Turk’ to the British public. Again, I dealt somewhat harshly with Winston Churchill in an earlier piece, so I’m leaving the poor man alone this time. There is another gentleman, however, who does deserve a little attention. T.E. Lawrence (of Arabia) was undoubtedly a scholar and a gentleman (at least on his father’s side, though he apparently adopted his mother’s family name, for reasons we don’t need to go into here). Nevertheless, it does now seem that some of the more titillating passages in his ‘Seven Pillars of Wisdom’ may have been influenced by his quirky sexual proclivities, which included paying a military colleague to administer beatings to him. Coming up to more modern times, I recently watched ‘Midnight Express’, that 70s classic film of a young American’s experiences in a Turkish prison. Well, I guess, it has come to be recognised as a somewhat exaggerated and distorted presentation of Turkey and its justice system. Billy Hayes, the real-life victim, and the scriptwriter who turned his book into a screenplay have subsequently admitted that fairly major liberties were taken in the making of the film. Perhaps there is no significance in the fact that the owner of MGM studios at the time was an Armenian-American, but you can’t help wondering. I have to say that, as I watched it, I couldn’t escape the feeling that, perhaps, US authorities, concerned at the activities of their young citizens abroad, might have had some input, in the interests of scaring them into being more careful. After all, Billy Hayes confessed in the film, if only to his father, that his aim was to make money by selling hashish back in the USA. I don’t know what the law says in Turkey or America, but in New Zealand, if you are caught in possession of more than a certain amount of a particular illegal substance, there is an assumption that you are a dealer. Well, Turks get a bad press; I guess that’s what I want to say. Some of it, perhaps they deserve. Show me the perfect country and I’ll move there tomorrow. But a lot of it they don’t deserve, and I’ve tried to show how our attitudes in the West have been shaped by ignorance, and sometimes, even by deliberate distortions. Turks themselves are not wholly innocent in the unfortunate image they have abroad. I recently asked some Turkish friends if Genghis Khan and Atilla the Hun were Turks. ‘Probably not,’ was the unanimous answer. And perhaps, to be fair, those names are not as common in classrooms as they once were. But sabre-rattling is an activity much-loved of nationalists everywhere, and the ignorant are easily exploited by unscrupulous politicians. In the end, the only defence is true knowledge. Seek it out! This entry was posted in Atilla the Hun, Crusades, Genghis Khan, Lawrence of Arabia, Midnight Express, Orientalist, Turkish Republic. Bookmark the permalink.